United States Consular Reports. Special Issue No. 10. By Phillip Carroll, U. S. Consul, Palermo. Sulphur, or brimstone, is a hard, brittle substance of various colors, from brilliant yellow to dark brown, without smell when cool, of a mild taste, and burns with a pale blue flame, emitting pungent and suffocating fumes. Its specific gravity is from 1.9 to 2.1. Sulphur exists more or less in all known countries, but the island of Sicily, it is thought, is the only place where it is produced on a large scale, and consequently that island appears to command the market. Small quantities have been found in the north of Italy, the Grecian Archipelago, Russia, Austria, Poland, France, Spain, eastern shores of Egypt, Tunis, Iceland, Brazil, Central America, and the United States. Large quantities are said to exist in various countries of Asia, but it is understood to be impracticable to utilize the same, consequent upon the distance from any commercial port and the absence of rail or other roads. Sulphur is of two kinds, one of which is of volcanic emanation, the other being closely allied to sedimentary rocks. The latter is found in Sicily, on the southern and central portions of the island. Mount Etna, situated in the east, seems to exert no influence in the formation of brimstone. 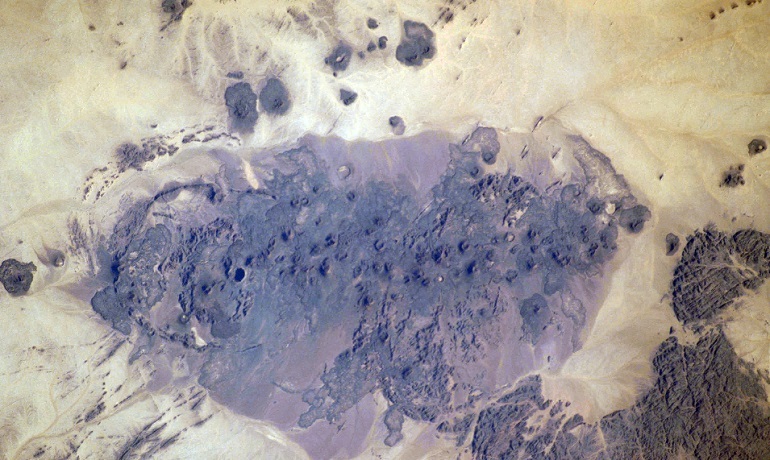 There are various hypotheses relative to its natural formation. Dr. Philip Swarzenburg attributes it to the emanations of sulphur vapor expelled from metallic matter existing in the earth, consequent upon the fire in the latter, while Professors Hoffman and Bischoff ascribe it to the decomposition of sulphureted hydrogen. 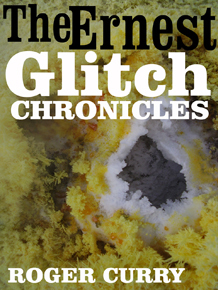 Hoffman believes the sulphureted hydrogen must have passed through the fissures of stratified rocks, but Bischoff is of opinion that the sulphureted hydrogen must have been the result of the decomposition of sulphate of lime in the presence of organic matter. The theory of others is that sulphur owes its origin to the combination of lacustrine deposits with vegetable matter, and others again suppose that it is due to the action of the sea upon animal remains. The huge banks of rock salt often met with in the vicinity of sulphur mines, and which in some places stretch for a distance of several miles, seem to indicate that the sea has worked its way into the subsoil. Fish and insects, which are frequently found in strata of tripoli, which lie under sulphur beds, induce the belief that lakes formerly existed in Sicily. Sandstone; coarse calcareous rock; marl. Calcareous marl; gypsum, etc. ; sulphur embedded in calcareous limestone; silicious limestone; tripoli, containing fossils of fish, insects' eggs, etc. Sandstone containing quartz, intercalated with marl of a saltish taste. Rock salt; blue marl, containing petroleum and bitumen; flintstone; ferruginous clay, mixed with aragonite and bituminous schists; ferruginous and silicious sandstone. Limestone, containing diaspores and shells. At times one or another of the strata disappears, while the order of some is slightly reversed on account of the broken state of the crust. Upon the whole, however, the above has been generally observed in the various mines by the author referred to. Sulphur mines have been operated in Sicily over three hundred years, but until the year 1820 its exportation was confined to narrow limits. At present the number of mines existing in Sicily is about three hundred, nearly two hundred of which, being operated on credit, are, it is understood, destined to an early demise. It is said that there are about 30,000,000 tons of sulphur in Sicily at present, and that the annual production amounts to about 400,000 tons. If this should be true, taking the foregoing as a basis, the supply will become exhausted in about seventy-five years. In 1819 a law was passed in Italy, which is still in force, governing mining in Sicily, which provides that should a land owner discover ore in his property he would be the owner thereof, and should have the right to mine, operate, or rent the property to others for that purpose, but if he should decline to operate his mines or to rent them to others to be operated, the state would rent them on its own account. Royalties vary from 12 to 45 per cent. They are paid according to the quality of the ore and the facilities for producing sulphur; 25 per cent. may, however, be taken as an average. There is a land tax of 36 per cent. of the net income, which is usually paid by the owners and lessees of the mines, in proportion to the quantity of sulphur which they produce. The export duty is 10 lire per ton. All mines are inspected by government officials once a year, and the owners are required to furnish the state with plans of the works and their progress, with a view to insure the safety of the workmen and to ascertain the extent of the property. Those who rent their mines receive from 10 to 40 per cent. of the sulphur produced. Leases are valid for such period as the contracting parties may stipulate therein. The general limit, however, is nine years. The average lease is 25 per cent., 40 per cent. being paid only when the mines are very favorably situated and the production good. Some lessees prefer paying a considerable sum in cash in advance, at the beginning of the term of the lease, and giving 15 or 20 per cent. in sulphur annually thereafter, instead of a higher percentage. The external indications of the presence of sulphur are the appearance of gypsum and sulphurous springs. These are indubitable signs of the presence of sulphur, and when discovered the process resorted to here, in order to reach the sulphur, is to bore a hole sufficiently large to admit a man, after which steps are constructed in the passage in order to facilitate the workmen in going to and fro. These steps extend across the passage, and are about 25 centimeters high and 35 broad. The inclination of the holes or passages varies from 30 to 50 degrees. Upon attaining the depth of several meters water is often met with, and in such considerable quantity that it is impossible to proceed. Hence it becomes necessary to either pump the water out or retreat in order to bore elsewhere. It is often necessary to bore several passages in order to discover the ore or seam of sulphur. When, however, it has been discovered the passages are made to follow its direction, whether upward or downward. As the direction of seams is in most cases irregular, that of the passages or galleries is likewise. Where the ore is rich and the matrix yielding, the miners break it by means of pick-axes and pikes, but when such is not the case gunpowder is resorted to, the ore in this case being carried to the surface by boys. The miners detach the ore from the surrounding material, and the cavities which ensue in consequence assume the appearance of vast caves, which are here and there supported by pillars of rock and ore in order to keep them from falling or giving way. In order to strengthen the galleries sterile rock is piled upon each side and cemented with gypsum. In extensive mines, however, these supports and linings are too weak, and not infrequently, as a result, the galleries and caverns give way, occasionally causing considerable havoc among the miners. Sulphur is found from the surface to a depth of 150 meters. The difficulties met with in operating mines are numerous, and among the greatest in this category are water, land slides, irregularity of seam, deleterious gases, hardness of rocks and matrices. Of these difficulties, water is the most frequently met with. Indeed, it is always present, and renders the constant use of pumps necessary. At one time miners were allowed to dig where they pleased so long as sulphur was extracted, the consequence being that in groups of mines, the extent and direction of which being unknown to their respective owners, one mine often fell into or upon another, thus causing destruction to life and property. It was largely for this reason, it is understood, that the government determined to require owners and lessees of mines to furnish plans thereof to proper authority, and directed that official inspection of the mines should be made at stated periods. In order to comply with the decree of the government it became necessary to employ mining engineers to draw the plans, etc., and those employed were generally foreigners. In the system of excavation described no steam power is employed. Pumping is performed by means of primitive wooden hand pumps, and when sufficient ore has been collected it is conveyed on the backs of boys to the surface - a slow, costly, and difficult procedure. This system may, however, be suitable to small mines, but in large mines there is no economy in hand labor; indeed, much is lost in time and expense by it. For this reason steam has been introduced into the larger and more important mines. The machinery employed is a hoisting apparatus, with a drum, around which a coil is wound, with the object of hoisting and lowering trucks in vertical shafts. Steam pumps serve to extract the water. The force of the hoisting apparatus varies from 15 to 50 horse power. The fuel consumed is English and French coal, the former being preferred, as it engenders greater heat. The cost of a ton of coal at the wharf is $4.40, whereas in the interior of the island it costs about $10. The shafts or pits are made in the ordinary way, great care being taken in lining them with masonry in order to guard against land slides. In level portions of the country vertical shafts are preferred, but where the mine is situated upon a hill a debouch may often be found below the sulphur seam, when an inclined plane is preferred, the ore being placed in trucks and allowed to run down the plane on rails until it reaches the exterior of the mine, where it suddenly and violently stops, and as a result the trucks are emptied of their load, when they are drawn up the plane to be refilled; and thus the process goes on indefinitely. In these mines a gutter is made in the inclined plane which carries off the water, thus dispensing with the necessity of a pump and the requisites to operate it. The galleries and inclined shafts are lined with beams of pine or larch, which are brought hither from Sardinia, as Sicily possesses very little timber. The mines are illuminated by means of iron oil lamps, the wicks of which are exposed. The lamps are imported from Germany. In certain cases an earthenware lamp, made on the island, and said to be a facsimile of those used by the Phoenicians, is employed. This lamp is made in the shape of a small bowl. It is filled with oil and a wick inserted, which hangs or extends outward, and is thus ignited, the flame being exposed to the air. Safety lamps are unknown, and those described are generally secure. Few explosions take place - only when confined carbonic hydrogen is met with in considerable quantities, and when the ventilation is not good. In this case the mine is easily ignited, and once on fire may burn for years. The only practical expedient for extinguishing the fire is to close all inlets and outlets in order to shut off the air. This, however, is difficult and takes time. Notwithstanding the closing of communications, the gases escape through the fissures and openings which obtain everywhere, and the ingress of air makes it next to impossible to extinguish the fire; hence it burns indefinitely or until the mine is exhausted. Occasionally the burning of a mine results beneficially to its owners, in that it dispenses with the necessity of smelting, and produces natural, refined sulphur. Silicious limestone, 60 lire per meter; daily progress, 0.20 meter. Gypsum, 50 lire per meter; daily progress, 0.30 meter. Marl, 30 lire per meter; daily progress, 0.50 meter. Clay, 15 lire per meter; daily progress, 1 meter. Laborers working in the ore are paid 4.30 lire per ton. This includes digging, extracting, and illumination. In some mines, however, the laborers are paid when the sulphur is fused and ready for exportation. One ton of sulphur, or its equivalent (say from 40 to 50 lire), is the amount generally paid. In mines where this system obtains the administration is only responsible for their maintenance. Each miner produces on an average about 1½ tons of ore daily, and when the works are not more than 40 meters in depth he employs one boy to assist him, two boys when they reach 60 meters, and three when under 100 meters. These boys are from seven to sixteen years of age, and are paid from 0.85 to 1.50 lire per day by the miner who employs them. They carry from 1,000 to 1,500 pounds of ore daily, or in from six to eight hours. The food consumed by miners is very meager, and consists of bread, oil, wine, or water; occasionally cheese, macaroni, and vegetables are added to the above. Mining laborers generally can neither read nor write, and when employed in mines distant from habitations or towns, live and sleep therein, or in the open air, depending on the season or the weather. In a few mines the laborers are, however, provided with suitable dwelling places, and a relief fund is in existence for the succor of the families of those who die in the service. This fund is greatly opposed by the miners, from whose wages from 1 to 2 per cent. is deducted for its maintenance. In the absence of a fund of this character, the sick or infirm are abandoned by their companions and left to die. Generally miners are inoffensive when fairly dealt with. They are said to be indolent and dishonest as a rule. The managers of mines receive from 3,000 to 5,000 lire per annum; chief miners from 1,500 to 2,500 lire; surveyors, 700 to 1,000 lire; and weighers and clerks, from 1,000 to 2,000 lire per annum. The total number of mining laborers in Sicily is estimated at about 25,000. The ore for fusion of the first grade as to yield contains from 20 to 25 per cent. of sulphur, that of the second grade from 15 to 20 per cent., and of the third grade 10 to 15 per cent. The usual means adopted for extracting sulphur from the ore is heat, which attains the height of 400 degrees Centigrade, smelting with the kiln, which in Sicilian dialect is called a "calcarone." The "calcarone" is capable of smelting several thousand tons of ore at a time and is operated in the open air. Part of the sulphur is burned in the process of smelting in order to liquefy the remainder. "Calcaroni" are situated as closely to the mouth of a shaft as possible, and if practicable on the side of a hill, in order that when the process of smelting is complete, the sulphur may run down the hill in channels prepared for the purpose. The shop of a "calcarone" is circular and the floor has an inclination of from 10 to 15 degrees. A design of a "calcarone" is herewith inclosed. The circular wall is made of rude stone work, cemented together with gypsum. The thickness of the wall at the back is 0.50 meter, and from this it gradually becomes thicker until in front, where it is 1 meter, when the diameter is to be 10 meters. In front of the thickest part of the wall an opening is left, measuring 1.20 meters high and 0.25 meter broad. Through this opening the liquid sulphur flows. Upon each side of this opening two walls are built at right angles with the circular wall, in order to strengthen the front of the kiln. These walls are 80 centimeters thick each and are roofed. A door is hinged to these walls, thus forming a small room in front of each kiln in which the keeper thereof resides from the commencement to the termination of the flow of sulphur. The inclined floor of the kiln is made of stone work and is covered with "ginesi," the name given to the refuse of a former process of smelting. The stone work is 20 centimeters thick, and the "ginesi" covering 25 centimeters, which gradually becomes thicker as it approaches its lowest extremity. The front part of the circular wall is 3.50 meters high and the back 1.80 meters. The interior of the wall is plastered with gypsum in order to render it impermeable. The cost of a "calcarone" of about 500 tons capacity is 800 lire. The capacity varies from 40 to 5,000 tons, or more, depending upon circumstances. If a mine is enabled to smelt the whole year round, the smaller "calcaroni," being more easily managed, are preferred; the inverse is the case as to the larger "calcaroni," when this is impracticable. When a "calcarone" is situated within 100 meters of a cereal farm, its operation is prohibited by law during the summer, lest the fumes of the sulphur should destroy the crop. When, however, the distance is greater from the farm or farms than 100 meters, smelting is permitted; but should any damage ensue to the crops as a result of the fumes, the owners of the "calcaroni" are required to liquidate it. Therefore the mines which are favorably situated smelt the entire year, and employ "calcaroni" of from 40 to 500 tons, as there is less risk of a process failing, which occasionally happens, and for the reason that the ore can be smelted as soon as it is extracted; whereas, when kilns or "calcaroni" are situated within or adjacent to the limit adverted to, they can only be operated five or six months in the year, consequent upon which the ore is necessarily stacked up all through the summer or until such time as smelting may be commenced without endangering the crops, when it becomes necessary to use "calcaroni" whose capacity amounts to several thousand tons. As intimated, these large "calcaroni" are not so manageable as those of smaller dimensions, and as a result many thousands of tons of sulphur are lost in the process of smelting, besides perhaps the loss of an entire year in labor. Again, the ore deteriorates or depreciates when long exposed to the air and rain, all of which, when practicable, render the kilns or "calcaroni" of the smaller capacity more advantageous and lucrative to those operating sulphur mines in Sicily. Smelting with a "calcarone" of 200 tons capacity consumes thirty days, one of 800 tons 60 days, and with a "calcarone" of 2,000 tons capacity from 90 to 120 days are consumed. In loading or filling the "calcaroni," the larger blocks of ore are placed at the bottom as well as against the mouth, in order to keep the lower part of the kiln as cool as possible with a view of preventing the liquid sulphur from becoming ignited as it passes down to where it makes its exit, etc. The blocks of ore thus first placed in position are, for obvious reasons, the most sterile. After the foundation is thoroughly laid the building of the "pile" is proceeded with, the larger blocks being placed in the center to form, as it were, the backbone of the pile; the smaller blocks of ore are arranged on the outside of these and in the interstices. The shape or form of the pile when completed is similar to a truncated cone, and when burning the kiln looks like a small volcano. When the kiln has been filled with ore, the whole is covered with ginesi with a view of preventing the escape of the fumes. The ore is then ignited by means of bundles of straw, impregnated or saturated with sulphur, being held above the thin portion of the top of the kiln, which is at once closed with ginesi, and the "calcarone" is left to itself for about a week. During the burning process the flames gradually descend, and the sulphur contained in the ore is melted by the heat from above. In about seven or eight days sulphuric fumes and sublimed sulphur commence to escape, when it becomes necessary to add a new coat of ginesi to the covering and thus prevent the destruction of vegetation by the sulphur fumes. The mouth of the kiln, which has been left open in order to create a draught, is closed up about this time with gypsum plaster. When the sulphur is all liquefied it finds its way to the most depressed part of the kiln, and there, upon encountering the large sterile blocks, quite cold, already referred to, solidifies. It is again liquefied by means of burning straw, whereupon an iron trough is inserted into a mouth made in the kiln for the purpose, and the reliquefied sulphur runs into it, from which it is immediately collected into wooden moulds, called "gadite," and which have been kept cool by being submerged in water. Upon its becoming thoroughly cool the sulphur is taken out of the moulds referred to, and is now in solid blocks, each weighing about 100 weight. Two of these blocks constitute a load for a mule, and cost from 4 to 5 francs. The above is the result when the operation succeeds; but this is not always the case. At times the sulphur becomes solidified before it reaches the mouth of the kiln, because of the heat not being sufficient to keep it liquid in its passage thereto, and other misfortunes not within control, and consequent upon the use of the larger kilns, or "calcaroni." When the sulphur ceases to run from the kiln, the process is complete. The residue is left to cool, which consumes from one to two months. The cooling process could be accomplished in much less time by permitting the air to enter the kiln, but this would be destructive to vegetation, and even to life, consequent upon the fumes of the sulphur. The greatest heat at a given time in a kiln is calculated to be above 650 degrees Centigrade - that is, at the close of the process. This enormous heat is generally allowed to waste, whereas it is understood it could be utilized in many ways. 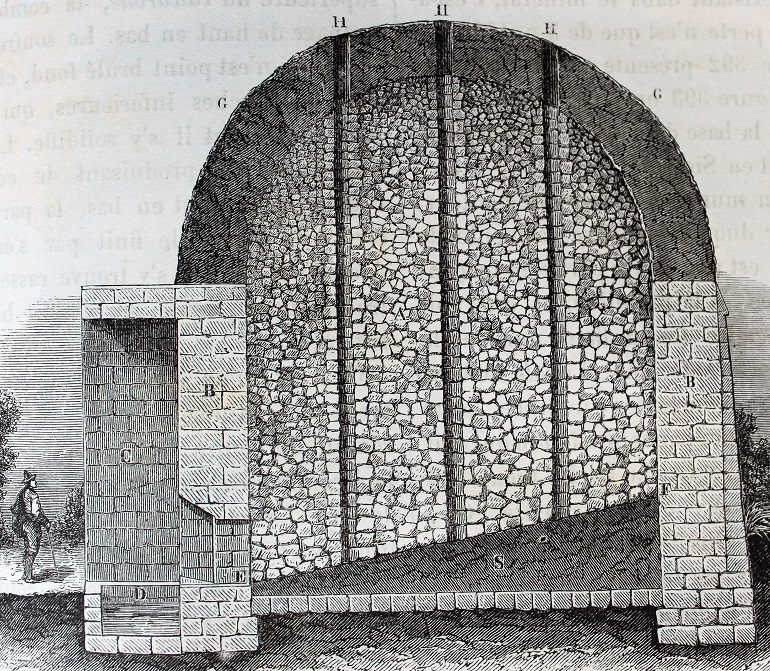 A gentleman of the name of Gill is understood to have invented a recuperative kiln, which will, if generally adopted, utilize the heat of former processes named. A ton of ore containing about 25 per cent. of sulphur yields 300 pounds of sulphur. This is considered a good yield. When it yields 200 pounds it is considered medium, and poor when only 75 pounds. Laborers are paid 0.40 lire per ton for loading and unloading kilns, and from thirty to forty hands are employed at a time. The keeper of a kiln receives from 2 to 2.50 lire per day. Notwithstanding the "calcarone" has many defects, it is the simplest and cheapest mode of smelting, and is preferred here to any other system requiring machinery and skilled labor to operate it. The following are the principal furnaces in use here: Durand's; Hirzel; Gill and Kayser's system of fusion; Conby Bollman process; Thomas steam process of smelting; and Robert Gill's recuperative kilns. Sulphur almost chemically pure, of a very bright and yellow color. Slightly inferior to the first quality; bright and yellow. Contains 4 to 5 per cent. of earthy matter, but is of a bright yellow. Dirty yellow, containing more earthy matter than that last named. Brownish yellow; this tint depends on the amount of bitumen which it contains. Light brown, containing much extraneous matter. These qualities are decided by color, not by test. The difference of price is from 3 to 10 francs per ton. Manufacturers prefer the third best, because of its containing more sulphuric acid and costing less than the sulphur of better quality. Sulphur free on board, brokerage, shipment, export duty, and all other expenses included, costs 20 lire per ton in excess of the above prices. Nearly all the sulphur exported from Palermo emanates from the Lercara mines, in the province of Palermo, the price per ton being as follows: first quality, 91.60 lire; second quality, 88.40. Sulphur is usually conveyed in steamers to foreign countries from Sicilian ports. The average freight per ton to New York is about as follows: From Palermo, 8.70 lire; from Catania, 13.50 lire; from Girgenti, 16 lire. An additional charge of 2.50 lire is made when the sulphur may be destined for other ports in the United States. Liebig once said that the degree of civilization of a nation and its wealth could be seen in its consumption of sulphuric acid. Now, although Italy produces immense quantities of sulphur, it cannot, on account of the scarcity of fuel, and other obvious reasons perhaps, compete with certain other countries in the manufacture and consumption of sulphuric acid. Sulphur is employed in the manufacture of sulphuric acid, and the latter serves in the manufacture of sulphate of soda, chloridic acid, carbonate of soda, azodic acid, ether, stearine candles, purification of oils in connection with precious metals and electric batteries. Nordhausen's sulphuric acid is employed in the manufacture of indigo. Sulphate of soda is employed in the manufacture of artificial soda, glassware, cold mixtures, and medicines. Carbonate of soda is used in the manufacture of soap, bleaching wool, coloring and painting tissues, and in the manufacture of fine crystal ware and the preparation of borax. Chloric acid is used in the preparation of chlorides with bioxide of manganese, and with chlorides in the preparation of hypochlorides of lime, known in commerce under the name of bleaching powder, and improperly called chloride of lime, which is used as a disinfectant in contagious diseases, in bleaching stuffs, and in the manufacture of paper from vegetable fibers, and in the manufacture of gelatine extracted from bones, as well as in fermenting molasses and in the manufacture of sugar from beet root. Sulphur is also used in the preparation of gunpowder and oil of vitriol, and in the manufacture of matches and cultivation of the vine. In the year 1838 the Neapolitan government granted a monopoly to a French company for the trade in sulphur. By the terms of the agreement the producers were required to sell their sulphur to the company at certain fixed prices, and the latter paid the government the sum of $350,000 annually in consideration of this requirement. This, however, was not a success, and tended to curtail the sulphur industry, and the government, discovering the agreement to be against its interests, annulled it, and established a free system of production, charging an export tax per ton only. At that time sulphuric acid was derived exclusively from sulphur. Hence the demand from all countries was great, and the prices paid for sulphur were high. It was about this period that the sulphur industry was at its zenith. The monopoly having been abolished, every mine did its utmost to produce as much sulphur as possible, and from the export duty exacted by the government there accrued to it a much larger revenue than that which it received during the period of the monopoly. The progress of science has, however, modified the state of things since then, as sulphur can now be obtained from pyrite or pyrite of iron. This discovery immediately caused the price of sulphur to fall, and the great demand therefore correspondingly ceased. In England, at the present time, it is understood that two-thirds of the sulphuric acid used is manufactured from pyrites. The decrease in prices caused many of the mines to suspend operations, and as a result the sulphur remained idle in stock. In 1884 an association was formed at Catania with a view to buying up sulphur thus stored away at the mines and various ports at low prices, and store it away until a favorable opportunity should present itself for the sale thereof. This had the effect of increasing the prices of sulphur in Sicily for some time, and the producers, discovering that the methods of the association increased the foreign demand for their produce as well as its prices, exported it directly themselves, thus breaking up the association referred to, as it was no longer a profitable concern. The railroad system, which in later years has placed the most important parts of Sicily in communication with the seaboard, has been most beneficial to the sulphur industry. A great saving has been made in transporting it to the ports. This was formerly (as stated) accomplished by carts drawn by mules at an enormous expense, as the roads were wretched, and unless some person of distinction contemplated passing over them, repairs were unknown.